Enjoy the best of the Gorge from this centrally-located site. 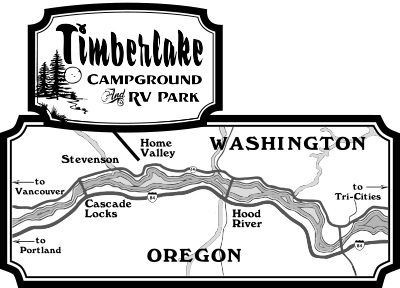 Located 50 miles east of Portland, Oregon and Vancouver, Washington, nestled in the heart of the Gorge, our forested 22 acre park was designed to provide the ultimate camping experience in a peaceful setting. Located away from highway and train noise. Bring your RV or tent and Camp the Gorge! Heading east to Timberlake Campground, highway 14 is one lane, winding and slower. Highway 84 is two lanes, cross toll Bridge of the Gods and continue on highway 14 east. Heading west to Timberlake, between White Salmon and Timberlake are 5 low clearance tunnels. All tunnels are safe to travel through. Stay in your lane & travel safely. We recommend you do not cross the Hood River Bridge in a motor home or towing. The Hood River Bridge is very narrow. Cross from highway 84 at the Dalles Bridge or continue west and cross the Bridge of the Gods and back track 15 minutes.